Ad blocking extensions have been possible on Safari for Mac for a long time, but plugin architecture for Safari on iOS is much more limited. With iOS 9, Apple has added a special case of extension for ad blockers. 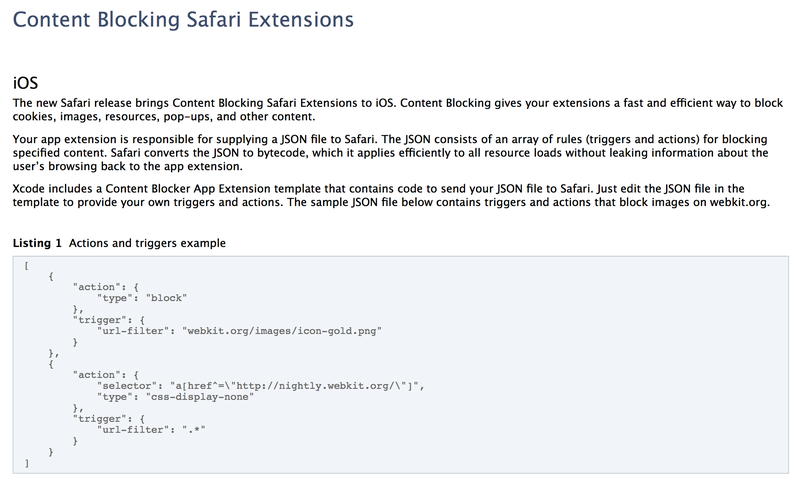 Apps can now include ‘content blocker’ extensions that define resources (like images and scripts) for Safari to not load. For the first time, this architecture makes ad blockers a real possibility for iOS developers to make and iOS customers to install and use. Online ad revenue makes up the vast majority of Google’s income, although Google has typically struggled with monetizing mobile. The addition of ad blockers to Safari on iOS won’t help that cause. When users download an app with an ad blocker extension, it shows up in Settings. Users can keep the app installed and disable the content blocker independently by using the toggle switches. It is still to be seen how Apple will let apps with content blockers get into the App Store. The approval process for something like this will have to be very stringent to prevent abuse. Hopefully, more details about this will come out soon.